M. Garzonio, "L'Ultimo eros del Picasso segreto," Vivimilano, Milan, September 1996 (illustrated, p. 23). "Zu den Bildern dieser Beilage," Die Zeit, Literatur, Hamburg, no. 43, 17 October 1997, p. 2 (illustrated, p. 10). 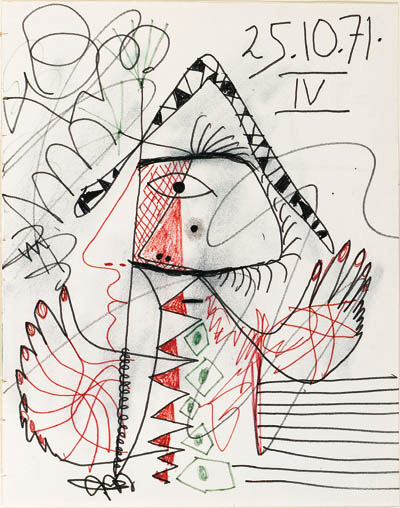 Picasso executed this drawing on his 90th birthday. To celebrate the occasion he depicted himself in the costume of Harlequin, a character from the Italian commedia dell'arte whom he used as a frequent subject in his blue, rose, cubist and classical periods. He wears Harlequin's customary peaked hat; the red triangles refer to the lozenge-shaped design of Harlequin's attire. Refering to his nine decades, Picasso stacked nine horizontal lines in the lower right corner, and his hands have nine or more fingers.